Because I live in the lowcountry of South Carolina, I just finished de-boning and washing a huge bag full of collards while reading over various recipes for black eyed peas to prepare the famously lucky New Years Day dish for my supper tonight. Here’s a great recipe featured in Garden and Gun Magazine from Elliotborough’s hot bed of soul food Hominy Grill. According to the tradition the peas stand for coins and the greens stand for the cash that will bring you prosperity in the new year, and who doesn’t need some of that? The dish known as Hoppin John has many suspected name sources but my favorite is that it is named after a Charleston street hawker named John who because of his missing leg had to hop. Since old Hoppin John no longer sells black eyed peas and collards in Charleston, I buy mine from the Piggly Wiggly on Meeting street. 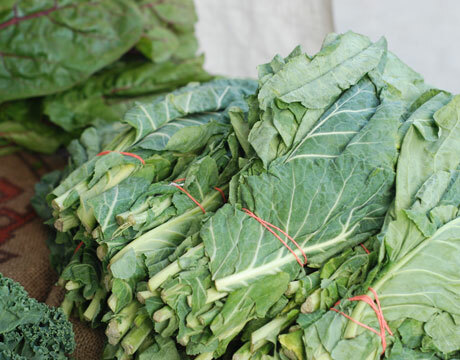 Here are some tips if you are a newbie to collards: buy a ton of them, they cook down. Don’t buy the pre-packaged chopped ones, because they are cut with the ribs in and it is very important to cut out the thick stalk running up the middle because it does not taste good. I use scissors and fill a clean sink with the “de boned” collards and then fill it with water because the best ones are usually very sandy. Then I wad them up in a plastic grocery bag still damp from the sink and stick them in the freezer. After they freeze they get really tender when thrown into a big pot with some hot olive oil chopped onion and garlic. The tight lid should steam them in minutes, and I like to add maple syrup once they have cooked down. Next to some white sticky rice topped with creamy black eyed peas, this delightful, can easily be vegetarian, dish can set you up for money and health, here’s to 2011.